grandma's cookie jar: crafting with grandma - Photo Love for Dad! crafting with grandma - Photo Love for Dad! If you are looking for a gift you could help even your youngest grandchildren make for their dad, look at this great idea I found on Pinterest for an "I Love You" photo! 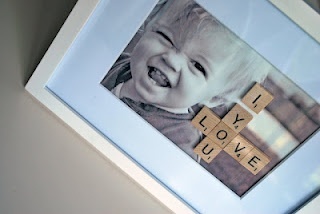 It looks pretty simple - you just need a photo, a frame, some old Scrabble tiles and glue - put it all together and, voila! A Great Gift!!! So, what do you think of this idea? A couple years ago I shared my Scrabble Family Board craft idea - you could help your grandchildren make one of these and the photo for a really wonderful Father's Day gift for sure! crafting with grandma - Life-Sized Drawings! Science Project - Popsicle Stick Chain Reaction! grandma's cookbook - Fun, Patriotic Strawberries! crafting with grandma - Stick Flag! crafting with grandma - Tie-Dye Shirts! More Summer Fun . . . Water Balloon Pinatas!!! Grandma Contest . . . Still Time to Enter! Summer Fun - Make Your Own Sprinkler! Summertime Rainy Day Fun . . . Make Spoon Bugs!!! Summertime Fun - Outdoor Classic Games! Summertime Fun - Build a Water Wall!!! Make a Summer Memory Wall!!! Summer Fun - 30 Great Ideas!!! grandma's chuckles - Time Out! grandma's cookbook - Strawberry Lemonade! Just for Fun!!! More Twin Trivia! crafting with grandma - DIY Photo Cube! Just for Fun!!! Did You Know . . . Twin Trivia!! Children's Day 2013 - What Great Fun!!! Just for Fun!!! More "Sand" Facts! grandma's cookbook - Baked Doughnuts!!! Favorite Thing to Do . . . Grandma Contest!!! Just for Fun!!! Did You Know . . . Sand Facts! Children's Day Gift Idea - DIY Angry Birds! Children's Day - and Night Fun! Children's Day Scavenger Hunt Fun! Children's Day - Let's Celebrate!